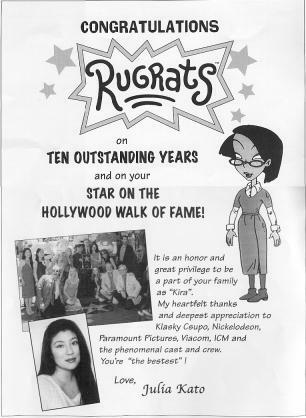 The 7/20/2001 issue of Daily Variety had a special section dedicated to the Rugrats. This issue featured special stories, histories, and of course, congratulatory ads for our favorite babies in this issue. Keep in mind, however, that this special appeared only in the Daily Variety, not the weekly version -- Daily Variety is mainly sold only in the Los Angeles and New York City areas, unlike the weekly version, which is sold throughout the US, Canada & Britain. Left: Cover of the 7/20/2001 issue of Daily Variety, featuring the Rugrats. 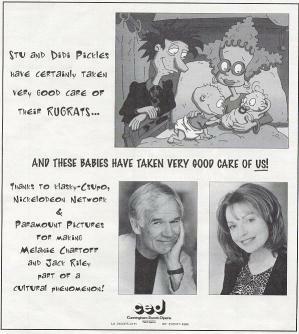 Right: An ad for Variety's request for ads for the 7/20/2001 Rugrats issue, from eBay. Both ©2001 Viacom. The real stars of any special Variety section are the congratulatory ads. These ads, placed by the producers, stars, technicians, friends, etc., congratulate the person or show that reached a milestone worth celebrating in Variety. 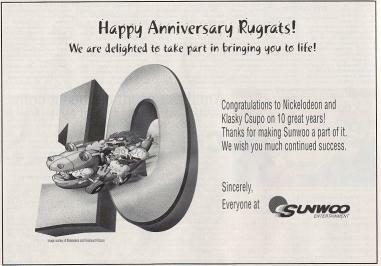 And the Rugrats' 10th Anniversary is no exception. The ads, mind you, don't come cheap -- they range from US$89 for a 2-inch by 1-inch ad (about a size of a large postage stamp), to a full-page ad that costs over US$3000. 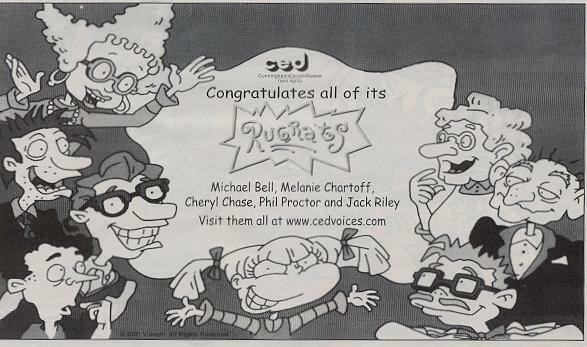 In late June 2001, yours truly has received an e-mail from Daily Variety, inviting me to place an ad in the special Rugrats section. Unfortunately, the rates were too rich for my blood, so I didn't buy an ad. Here are the ads that appeared in that special section. the back cover. 2. 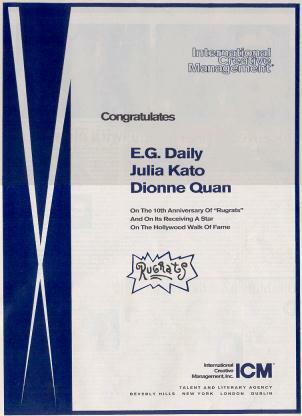 Julia Kato's ad, seen on the inside front cover. 3. Cheryl Chase's ad. 4. 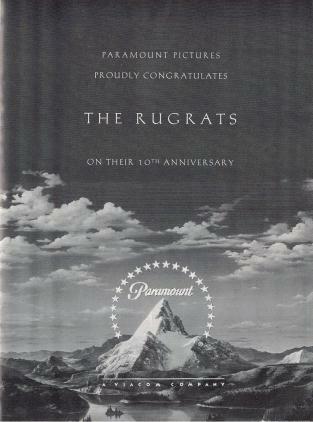 Ad from Paramount Pictures. 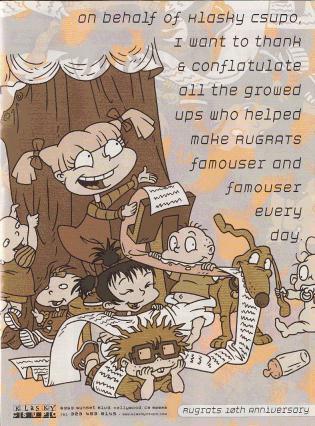 who does the overseas animation for "Rugrats". producers and creators of "Rugrats". they also represent voices Michael Bell, Cheryl Chase and Phil Proctor. 10. 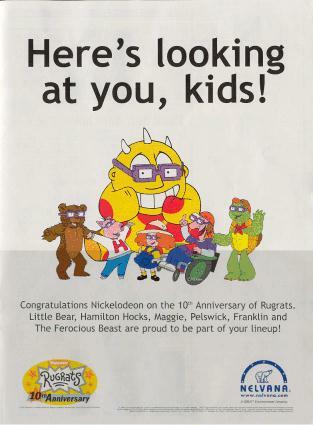 Ad from Nelvana, the only advertsier that has nothing to do with "Rugrats". 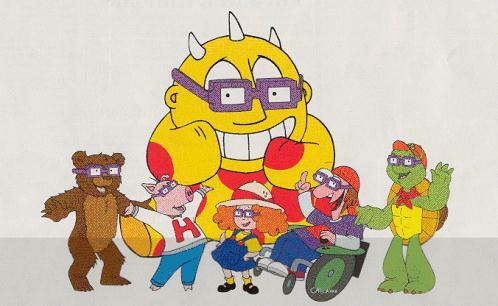 Note that Nelvana's popular characters , all seen on Nick, are wearing Chuckie glasses. and Tara Strong. 12. 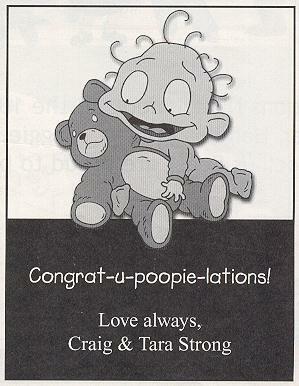 Ad from Tara Strong and her husband, Craig.